Believe in possibilities. 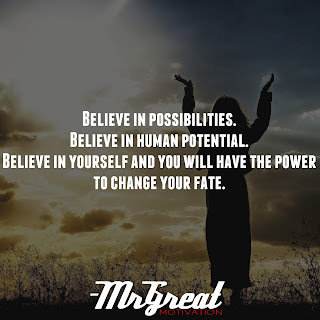 Believe in human potential. Believe in yourself and you will have the power to change your fate. Home Motivational Quotes Believe in possibilities. 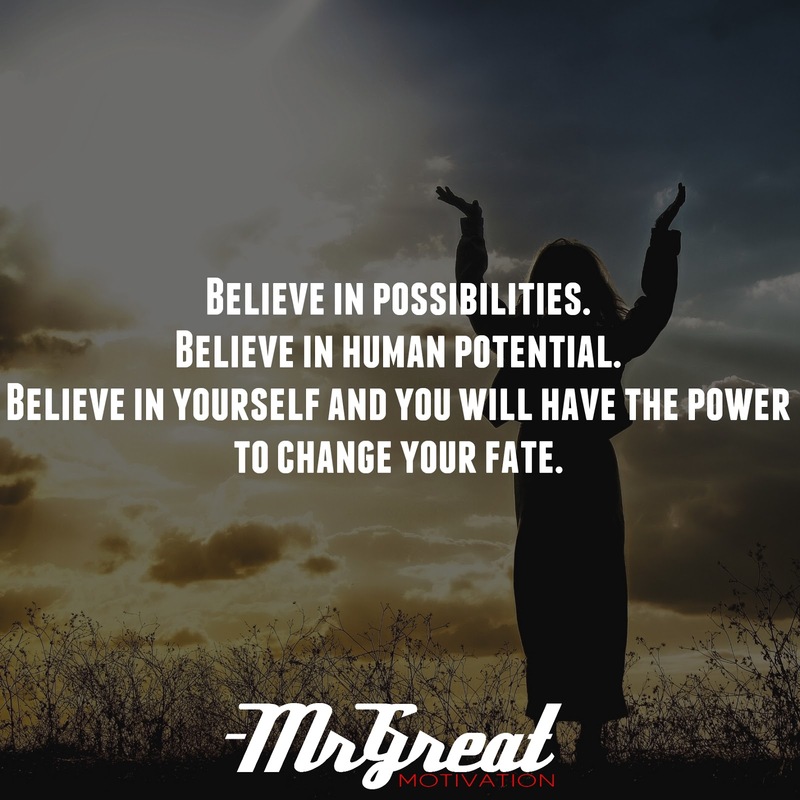 Believe in human potential. Believe in yourself and you will have the power to change your fate. Sometimes life can dare us hurdles that seem improbable and unfair. It’s easy to stay motivated when things are going great. But what about when things aren’t going so great? Then, the judgment and self-doubts start to slither in, and it comes harder to feel good and stay positive. Inspire yourself – you have what it takes to change your life for the better. Motivate yourself – no matter where you are in life right now, you possess abilities that can achieve great things. The strength to gather new skills, to learn, talents to create, to make plans, to dream. Believe in your strengths to take action, overcome obstacles, and fight through disappointments.The point here is that in changing your level of skill and competency, it’d be possible to move towards creating a reality that differs to your existing one. We cannot risk not having belief in ourselves. In order to accomplish our goals, we have to believe that we can. Even if everyone else has our back, if we tell ourselves day in and day out that we can’t be successful, chances are that we won’t be. Make sure that in addition to placing trust in others, you are also placing trust in yourself. Your strength to achieve and experience success in any effort starts in your mind and is dependent on how open you are to consider the possibilities. What you think, and what you’re prepared to see matters!